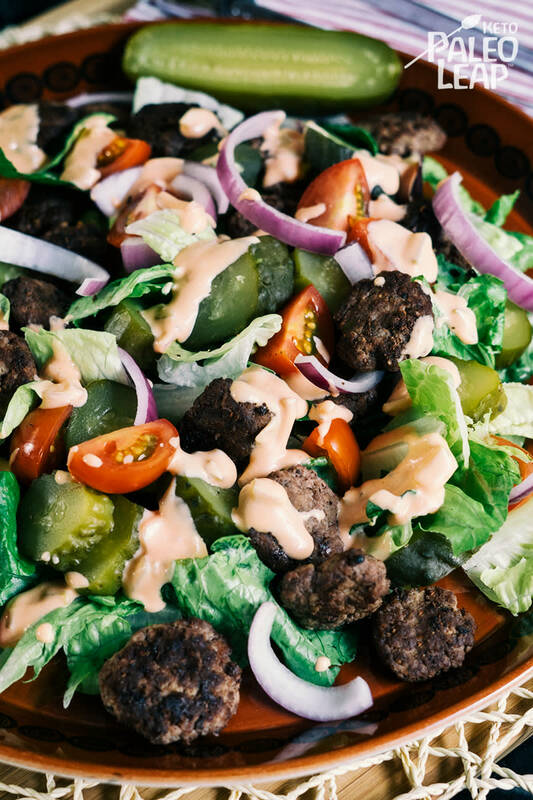 Forget the bun and make a hamburger salad instead – it was an ingenious thought that arrived with Paleo and Keto principles, so we followed up with it and here’s what we found: small beef burgers tossed with fresh greens and smothered in a tomato-mayo-smoked paprika spiced sauce is way too good not to eat again. Reminisce about the bun all you want, but it is really not necessary, nor healthy, to eat modern grains – though you can sprinkle some poppy seeds on your salad as a reminder to the good old days. While we embrace slow cooked meals, we realize the importance of nourished zippy cooking too, for life sometimes moves at a faster speed than we would like. This recipe is great on those whirlwind days when you just don’t know what to cook, when you aren’t feeling as explorative in ingredients and you want to know for sure that no one will protest, after all what’s not to love about ketchup and mustard? We know you will want a bite or two of dessert afterwards, something with more than a whisper of chocolate… We have just the thing: chocolate almond butter fat bombs. One bite into the divine chocolate and the entire meal will definitely be requested, again and again. Form small patties with the ground beef (think small meatball size, but flattened), and season both sides generously with sea salt and freshly ground black pepper. In a small bowl combine all the ingredients for the dressing; season to taste and whisk well. Cook the small burger patties in the skillet 3 to 4 minutes per side, then set aside. In a salad bowl add all the remaining ingredients, and drizzle with the dressing. Add the beef patties to the salad, gently toss until everything is well coated.